If you want to stray from the dark blue uniform, use your cap to show off your personality with a quippy saying or meme. It’s hard to stand out in a crowd of caps and gowns. If you want to diverge from the dark blue uniform, use your cap to show off your personality. 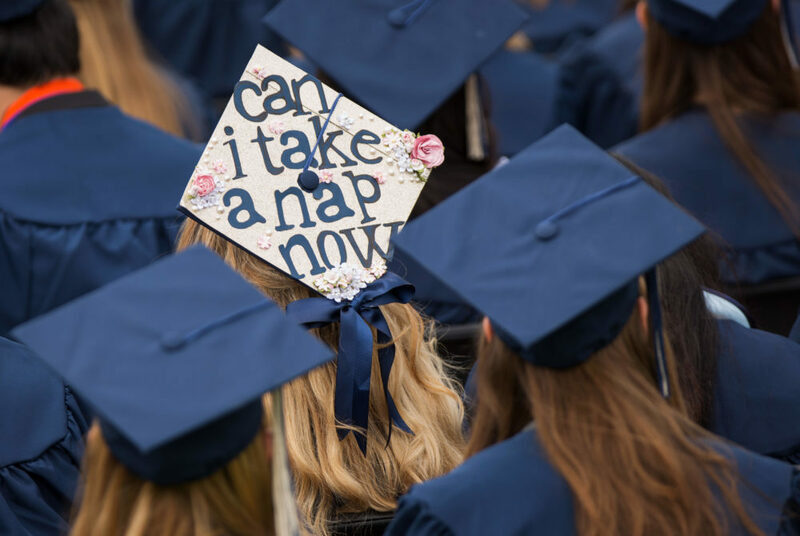 Whether you are a fussy crafts queen or the king of memes, here are some tips to make your graduation cap stand out. Every student has a post on “GW memes for The 10th most politically active teens” that they’ve been tagged in numerous times. Use your graduation cap to pay tribute to it. You can cherry pick your college’s starter pack to be on theme for your school’s ceremony or make your cap a love letter to your second home – “The Bench” of Sigma Chi. For the University-wide ceremony, find a Marcia McNutt joke and students behind you will snicker at your timely campus commentary. Head to a campus printer on the morning of commencement in your gown to stay loyal to your procrastinating ways and tap the touchscreen one last time to print out your meme. Once you have a color copy ($0.85) of your joke in hand, all-purpose glue from CVS ($2.79) is the most convenient way to attach your last-minute decoration, so stop by before heading down to the National Mall. You may not be the Picasso of cap decorating, but you’ll give students a good laugh as the ceremony drones on. For the artsy student who loves to raid a craft store, graduation caps can be a great form of expression, but all those foam letters can add to the college debt you’ll soon be paying off. Plaza Artist Materials and Picture Framing at 1120 19th St. NW, sell stencils of the alphabet ($4 to $7.50) and an assortment of paints, brushes and writing utensils to leave your mark at the ceremony with any design you can create. If you aren’t trying to spend your hard-earned graduation money on craft supplies, ask your family to pack up leftover glitter glue and construction paper stored in your old closet. You might need to clear up space anyway for when you move back to your parents’ house. Don’t be afraid to take scissors to some of your precious polaroids and other memorabilia to decorate the top of your cap with memories of the past four years. A simple, patterned cap without fancy or offensive ornaments is the future politician’s best decorative bet. While no one can say GW hasn’t prepared you to handle a scandal or two, it’s best to save your future apology post for when pictures of you at formal weekend get uncovered. Match your Brooks Brothers suit or subtle, solid-colored dress with a latticed cap pattern of hot-glued ribbons, preferably in a school color. Indistinguishable from the crowd, it’ll make sneaky swigs from a flask less noticeable during the ceremony. Or take a different approach and use the square foot of real estate atop your head as a resume. You never know who might be in the crowd, so your cap should include your LinkedIn URL at the very least, if it doesn’t spell out your information like a business card on the back of your head. Juxtaposed next to sillier headwear, your cap will help you subliminally market yourself to potential future bosses.